Kelly Burkhart was born and raised in Midland, Texas. He earned a Bachelor of Arts degree in Religion from Baylor University and a Master of Divinity degree from George W. Truett Theological Seminary in December 2004. While attending seminary, he was recognized and awarded as a Cooperative Baptist Fellowship Leadership Scholar. Kelly is currently working on a Doctor of Ministry degree at George W. Truett Theological Seminary and expects to graduate in 2020. 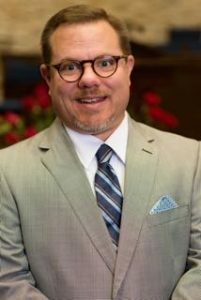 Kelly’s professional memberships include the Cooperative Baptist Fellowship’s Coordinating Council, the Cooperative Baptist Fellowship Texas’ Coordinating Council; and Current, the young leaders’ network for the Cooperative Baptist Fellowship, for which he has served as co-chair. Kelly is currently serving on the Board of Directors for Baptist News Global and is the current Moderator for CBF Texas (2018-2019).